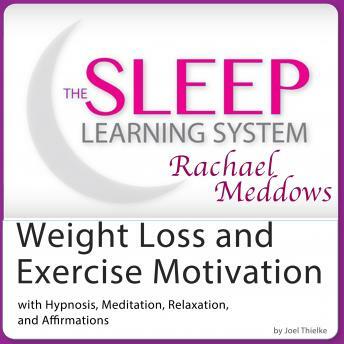 Get more excited and motivated to exercise, and start losing weight and tone your muscles with this soothing program from the world-renowned Sleep Learning System, narrated by best selling hypnotherapist, Rachael Meddows. The Sleep Learning System is specially designed to work with your subconscious mind during your sleep cycle. The guided meditation and soothing background music will deeply relax your body and mind for the perfect night's sleep, while allowing you to access the deepest parts of your mind. And now Sleep Learning is better than ever, thanks to the soothing voice of Rachael Meddows. With this audiobook, you will get more motivated to work out on a regular basis and tone up your body - all while you sleep. This program comes with new two inductions that are exclusive to Sleep Learning programs with Rachael Meddows! When you wake up you'll feel energized, focused, and ready to work out. This guided mediation system gives you positive suggestions that will help you quiet your mind and melt away stress, leaving your body deeply relaxed for a great night's sleep. While you're sleeping, the program will help remove bad habits and limited self-beliefs that are stopping you from working out, and boosting your energy throughout your day.